It's an odd thing to feel like there's so much for you to control, and at the same time need to ask for help and delegate when you can in order to manage it all. My husband got into our state's paid caregiver program last spring. He qualifies for someone to come into our home solely to help him. We can have an agency send someone, or we can have a friend or family member trained to do the job. We currently have a caregiver through an agency. I used to be the sort of person who got very nervous when it came to having company in my home. We rarely did for so long (before we moved to Washington where some of my family lives and we actually made some friends). But I have had to get comfortable with people traipsing in and out of our home over the last year. Home health nurses, social workers, various friends and family visits, and now a paid caregiver have made it impossible for me to continue to hold onto any hang-ups I once had. Welcome to our home! Come in, don't be shy, take off your shoes and make yourself comfortable! I haven't vacuumed yet and there are dishes piled in the sink? Whatevs! It's amazing how many people it takes to take care of, and take up the slack for, one person. The ill person turns to their primary caregiver, and that caregiver needs others to turn to as well. Especially a caregiver who also has limitations (my bad eyes = I can't drive). Sometimes, I feel like I should get a tattoo on my forehead that reads "needy". 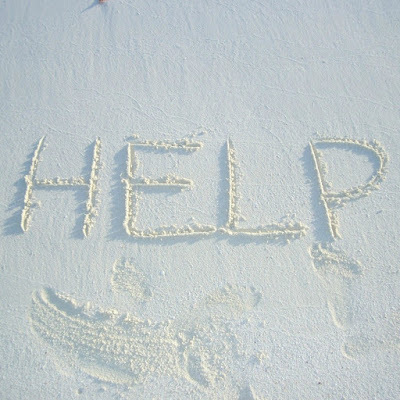 I have had to work real hard in the last 20+ years to let go of any pride I might feel over asking for help. Honestly, everyone should let go of that kind of pride. 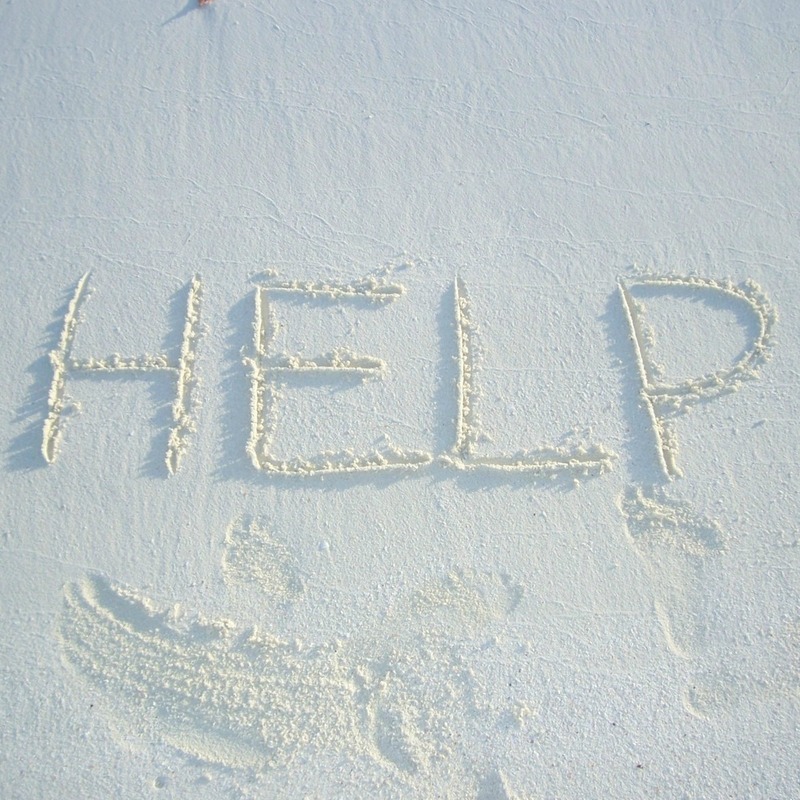 There is no reason in the world why anyone should feel like they can't or shouldn't ask for help when they need it. 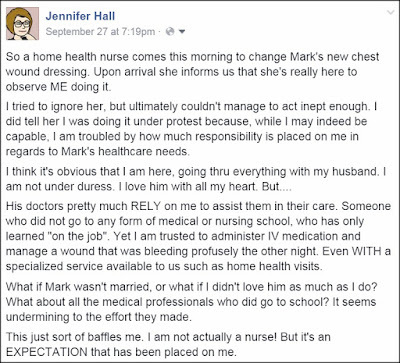 Even with a "paid caregiver" available to us, there is much she cannot do. I am still responsible for dressing changes on the days when a home health nurse isn't coming, and currently, for his daily infusions of an anti-fungal medication. 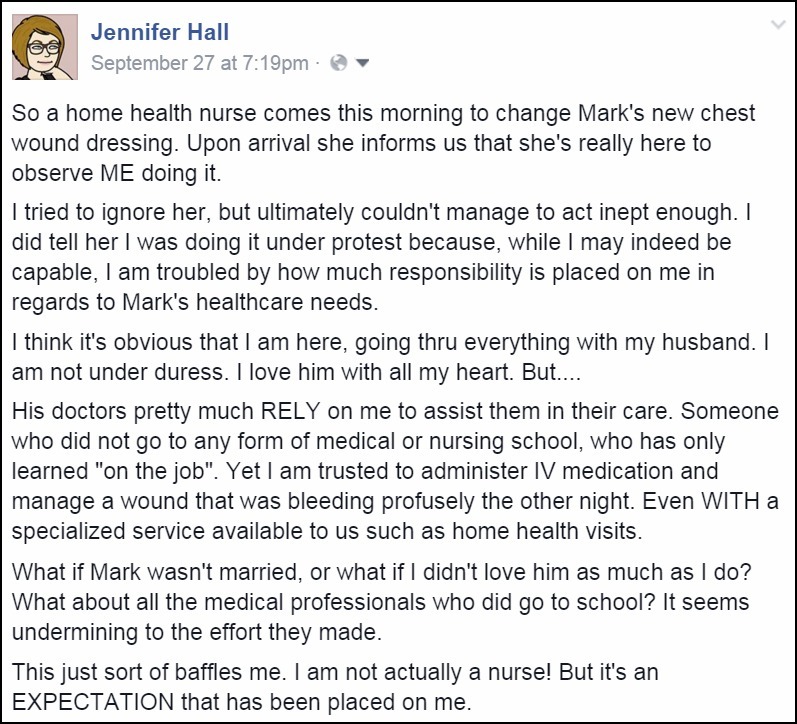 In fact, I have been struggling with how much responsibility for Mark's care is foisted upon me as his spouse. Doctors and nurses look at me with great expectation and it has felt overwhelming lately. Because of this, I absolutely delegate wherever and whenever I can. Not because I don't want to do things or I don't care to. Rather, because I would like to be Mark's wife and friend first. I would prefer to have more time to hang out with my family instead of only taking care of responsibilities. And for self-care. I'm learning just how important that really is. Even though I still have more to learn about prioritizing it. Mark continues to trust me most, wants me to handle and be there for his stuff most. I get that. Of course. We have always been a team, and a good one at that. But every team needs backup players. I let the paid caregiver take him to some appointments without me. I have the two of them run errands, and I love it when she has time to make dinner before she leaves (if I've had the presence of mind to plan for it). If there isn't much to GO do, she will (mostly) do Mark's laundry. I know I can ask my dad to stop at the pharmacy on his way home from work. I have a good friend just two miles up the road, and my aunt has made herself available many times. I've been slowly but surely nudging the kids into helping me with more of the household chores too. Just recently I changed my regular routine around so that I wait until they get home from school to do some tasks so they can pitch in, thus giving me more time for other things while they're at school. I really don't know why I didn't think of that one sooner! Much has changed, and not for happy reasons. But we are adapting, with a lot of help.